Sarah Delappe’s The Wolves is one of the finest pieces of theatre I’ve had the pleasure to see. It’s not an exaggeration to say that Howland Company’s production has everything. It’s fresh, witty, heartwarming, moving and tragic. Rarely could I recommend a play so wholeheartedly. 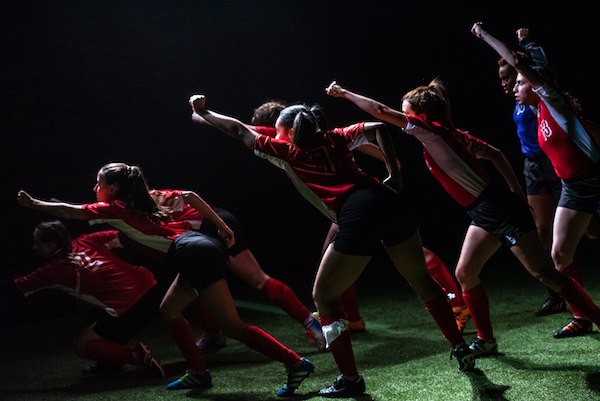 The cast consists mostly of nine female and non-binary teenagers in a soccer squad, who bicker, debate and laugh in their stretching circle before matches. The lightning-fast dialogue jumps around the circle as they cover every topic from the Khmer Rouge to tampons. There’s so much going on, but it feels completely natural and easy to follow. Director Courtney Ch’ng Lancaster has eked out every subtlety from a phenomenal script. Humour is dotted around the play effortlessly, while we learn more and more about each character. Interwoven into their conversations, we hear about challenges they’re dealing with, like the new kid on the block struggling to fit in, and a rumoured unplanned pregnancy. The competition between the players also heats up as an agent from a college surprisingly turns up for one of their games. It really is impossible to pick out a specific performance for special mention. In just 90 minutes, the audience gets to know each player very quickly. The casting is perfect – all of the different characters seem to be very well-balanced. They go by their soccer numbers instead of names, which makes it easier for the audience to follow. You feel like you know them personally, which makes tragic events later in the play hit especially hard. Near the end we also meet a soccer mom, played by Robyn Stevan, who gives a short but stunning performance. Movement in the play, from stretching to training routines and theatrical representations of matches, keeps up the pace and interacts effectively with the dialogue. Sarah Doucet’s movement work must be applauded, and you can tell the actors have been playing soccer together for some time. The Crow’s Theatre venue has been set up to feel a bit like a sports hall. With a thrust stage, the set is a simple square of artificial grass. The simple yet striking lighting designs of Jareth Li and Scarlett Larry bring it to life, though, in sync with the actors’ movements. Likewise, Deanna H. Choi’s sound and music complemented the action, pushing the play forward but never getting in the way. This production is very hard to fault. The care and attention that has gone into the play has made it very special. I can’t wait to see what will come next from Sarah Delappe – The Wolves is only her debut and was a Pulitzer finalist last year – and from the Howland Company. These tickets are going to go quickly, and it’s nothing less than they deserve.